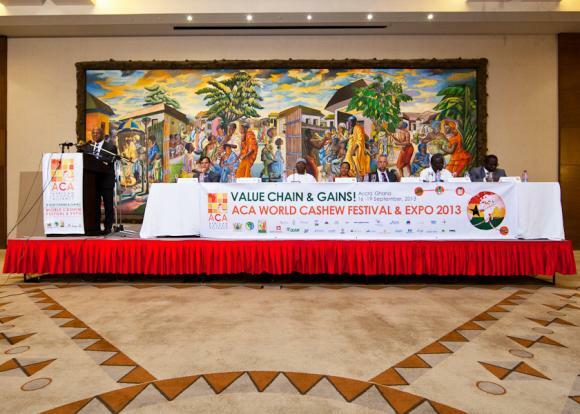 On 16-19th September, 2013, cashew industry representatives convened in Accra, Ghana, for the ACA World Cashew Festival and Expo 2013. The African Cashew Alliance's 8th annual conference drew nearly 350 participants from all over the world. At the Opening Ceremony, ACA President Georgette Taraf welcomed a full room of participants with excitement for the days to come. Addressing participants she said, “I am sure that you will all once again be agents for change and growth in the cashew sector in Africa.” Alongside the ACA President, government ministers from Cote d’Ivoire, Tanzania, Burkina Faso and of course Ghana welcomed participants. The level of minsterial attendance made clear the widespread belief among governments that cashew has the potential to be a major factor in development and poverty reduction. Ghana's Minister of Trade and Industry Honorable Haruna Iddrisu announced a Government stimulus program for cashews in the country. This year's plenary session focused on a variety of topics that are central to the cashew sector in Africa and around the world. Leaders from the private and public sectors discussed topics including farmer-processors partnerships and investment opportunities along the cashew value chain. The day concluded with an exploration of new market opportunities by Dr. Kantha Shelke of Corvus Blue LLC and Harry Sinclair of Kraft Foods. These two keynote speakers outlined the potential uses for cashew splits and the current position of cashews in the snack market, predicting a very positive future for the nut. On the third day of the conference, participants split off into 5 separate breakout sessions throughout the day, covering topics ranging from Farming Techniques to Processing Techniques and Technologies. At the Business-to-Business Forum, traders, processors, farmers, and foreign buyers were matched in one-to-one business meetings tailored to their business interests. The evening saw the traditonal Gala Dinner where, amid dinner, drinks and dancing, the ACA announced that the 2014 annual conference will be held in Kenya. The conference wrapped up on Thursday with different groups of delegates setting out on three different field trips throughout Ghana: Kakum National Park, where they bravely crossed a canopy walk that stretches above the beautiful rainforest; Mim Cashew factory, for an in-depth look at modern cashew processing; and Wenchi Agricultural Research Station, to explore the latest research on cashew farming in the company of scientific experts. The African Cashew Alliance expresses its sincere thanks to its Festival sponsors, delegates, and all those who helped make the 2013 World Cashew Festival & Expo a huge success. ACA members can see the full list of Festival participants here.